The Sindh Auqaf Department has decided to undertake the construction of Abdullah Shah Ghazi Mazar complex, said Sindh Auqaf Minister Abdul Haseeb on Sunday. Haseeb said that a meeting of the Mazar Management Committee, which was constituted for the purpose, has been convened. The minister pointed out that prequalification tenders for redesigning the shrine complex and project estimation had been floated this month. He said that out of a dozen companies who had obtained tender forms, six submitted their bids and three of them have qualified after scrutiny. Haseeb said that the qualified companies would submit their Request for Proposal by July 9. He further stated that his department has taken various measures to provide proper security at major shrines, including the Abdullah Shah Ghazi shrine where four walkthrough gates and 18 surveillance cameras have been installed. He said that besides private security deployed at the shrine, metal detectors are also being used. He said that surveillance cameras have been installed at other shrines as well. 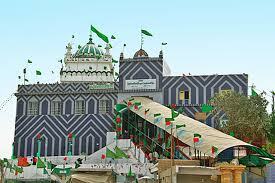 These include 26 at the shrine of Shah Abdul Latif Bhittai and 16 at the Lal Shahbaz Qalandar shrine.